The theme this fortnight at Pile It On is Humor/Puns and/or Plaid. The only really rule is to be inspired by more than one papercrafting challenge. We're sponsored by Dr. Digi's House of Stamps, and I used his Pride and Joy digi stamp. The image was colored with Copic markers, fussy-cut, and placed onto a photo background that I got from a magazine. The border was made with a cork sheet & a QuicKutz die. The mats and base card are cut from the backing paper that came with the cork sheet! 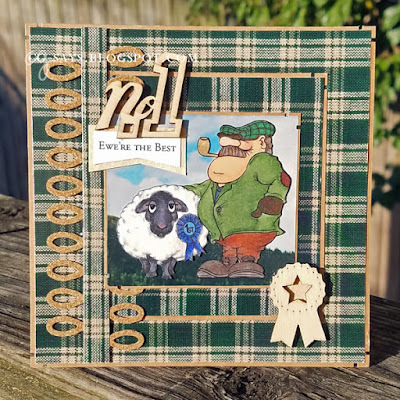 I've had this plaid DP in my stash forever, and it was perfect for this project. I made the silly sentiment & backed it with some wood tape. I didn't do anything to the wood veneer embellishments, except for putting a bit of wood tape behind the star, because I thought it would distract. I used a ZIG glue pen to add white flocking to the sheep. Update: This was chosen as a Top Pick for Sketch-Tanten #30. Thank you, Andrea! What a fun card, CG! Love the plaid and your whole design! Thanks for sharing it with us at the Simon Says Stamp Wednesday challenge! Fab wooden elements and a super masculine card. Thanks for playing at The Male Room. Wow! Einfach fabelhaft! 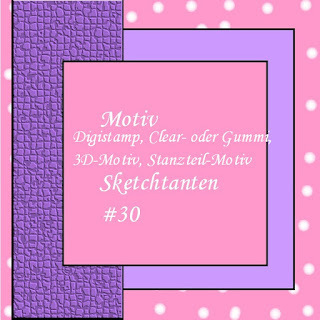 Danke daß du bei den Sketch-Tanten mitmachst. What a great masculine card-I just love that image! I'm going to see if they have any cow images. Thanks for joining us at Die Cut Diva's Animal challenge! Ha ha... what a fun Card. Nice colours too! Very funny! That image is just too cute, plus on the photo background-- I love that look! Your cork and wood veneer make me happy as I slats live seeing natural colors,and they look terrific with the plaid. Thank you for sharing at SOS this week! Very nice card and image thanks for sharing!!! Deine Karte ist echt toll. Das Motiv ist richtig klasse. Mal etwas ganz anderes. Gefällt mir sehr gut. Vielen Dank für deine Teilnahme bei den Sketch-Tanten. What a cute fun card. Love the shading on that big guy. So glad you joined us at Die Cut Divas. perfect plaid background and image colouring CG. This is such a fun card! I do like the plaid, works so well with the image. And that wooden star award is just fab! Thanks so much for playing along with our Wood stash challenge at The Male Room. Deborah, DT. This card is hilarious!! !The look on that sheep just cracks me up. Your plaid patterned paper goes right along with your theme.. Your wood accents are perfect for our challenge!! Great card and so well crafted. Thank you so much for joining us at The Male Room. Your card is so wonderful.